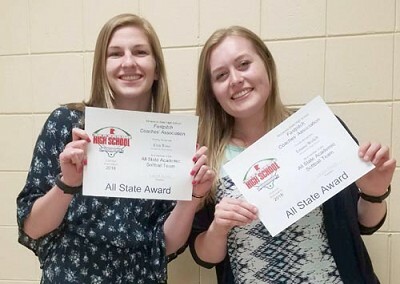 Stewartville softball players Erin Ross (left) and Emma Welch were honored at the annual awards ceremony for being named to the 2018 MSHSL All-State Academic Softball Team. The Stewartville softball team honored its top players at the annual awards ceremony recently. Tiger team members honored included, from left, Raegan Eickhoff (All-HVL honorable mention, Spark Plug Award), Aari Sikkink (Golden Glove Award), Emma Welch (HVL All-Conference, 1AA All-Section, Batting Champ), Carlie Hildebrandt (HVL All-Conference, Golden Glove Award, Team Most Valuable Player Award), Taylor Smith (All-HVL honorable mention, Team Most Improved Award).